Bose A20 Headset with coiled cable and LEMO plug for insertion into the panel connector of an installed wire harness. 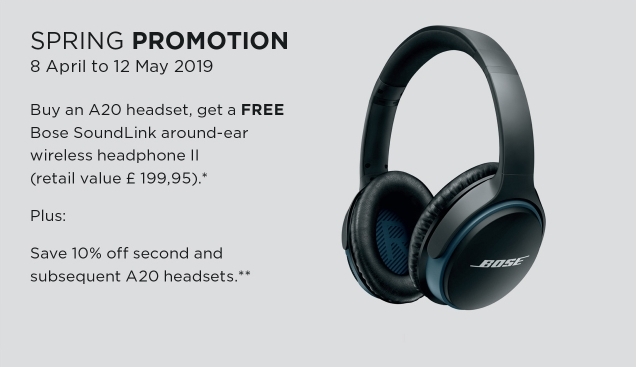 The Bose A20 aviation headset reduce more noise than ever before, across the full spectrum of human hearing, in even louder environments. Advanced electronics now use microphones both inside and outside each ear cup to sense and reduce more ambient sound. Improved Bose ear cushion technology helps further reduce unwanted noise. New cushion materials block more sound before it enters the ear cups, providing an even quieter headset experience. The A20 aviation headset also provides a new level of comfort and stability. The overall headset profile is more compact, but the ear cup cavity has been enlarged to allow more room for the ears. These proprietary cushions improve the ear cups' acoustic seals, even over eye glasses, and remain comfortable during long flights. The solid magnesium headband is extremely durable, yet lightweight, and its sheepskin cushion eliminates hot spots. All these improvements have been achieved without increasing the headset's weight or clamping force. The A20 headset weighs just 12 ounces and exerts significantly less clamping force than most active headsets. Significantly improved noise reduction across a wider range of frequencies. Proprietary Bose innovations now use microphones both inside and outside each ear cup to sense and reduce more ambient aircraft noise. TriPort acoustic headset structure, available only from Bose, produces tonally balanced audio from relatively small and lightweight headphones. Active equalization electronically tunes the headphones' frequency response, enabling outstanding audio performance.